Click here to link to the map of cemeteries in Essex County in Google Maps (opens in a new window). 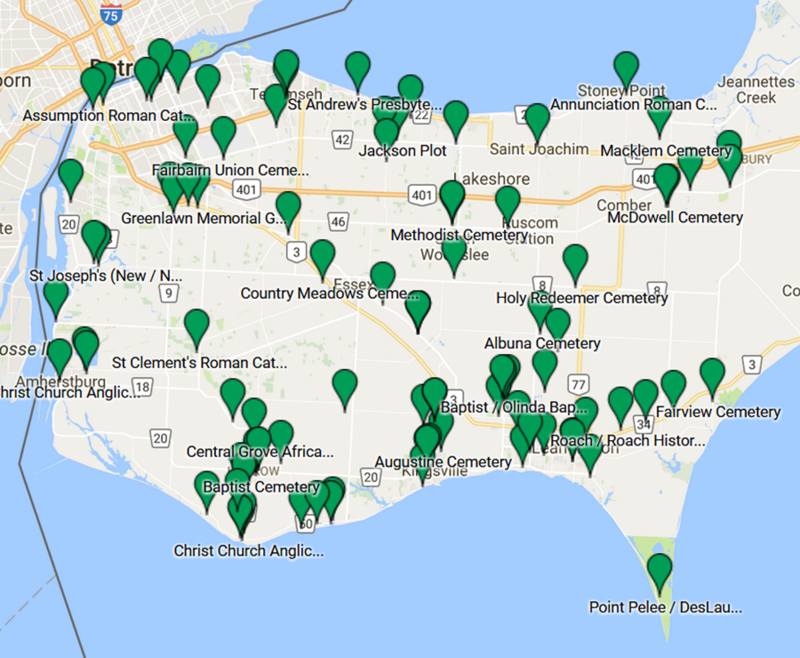 Names and locations of cemeteries are based on a list compiled by Ontario Ancestors (OA) and active Essex branch members. Note that some locations are private property and permission must be obtained from the owner before entering. Also, some locations may be former burial sites from which all remains and headstones have been relocated. Many of the cemeteries located on the map above have been transcribed by volunteers. Some of those transcriptions are indexed below. 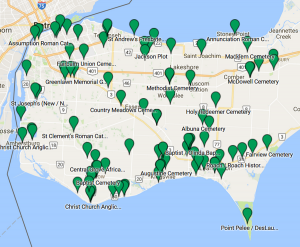 The EssexOA Transcriptions of Cemeteries in Windsor-Essex County are searchable PDF’s of indexes of Essex County cemeteries (Leamington, Kingsville, Harrow, Pelee, Maidstone, Amherstburg, Puce etc) transcribed. If you are a member of the Essex Branch of OA, full transcriptions are available for free on the Members Only site. Non-members may purchase the full transcriptions of the cemetery on our E-store. Alternatively, they are available on a “pay per view ” basis by contacting the researcher for the Essex Branch of the OA ( essexresearch@ogs.on.ca ). The EssexOA publication collection includes all of these cemetery transcriptions and is currently located at the Windsor Public Library, 2nd Floor (WPL & the collection are moving June 2019). An Alphabetical Index for all Essex County Cemeteries A – G, H – N, O – Z : These three files include all the cemeteries listed below transcribed by 2012 and therefore do not include Heavenly Rest in Windsor. However, included are other death records including Assumption Burial Records to 1900, Our Lady of the Lake Burial Records 1891-1977, Rose Hill Cemetery Burial Records Amherstburg, tombstone inscriptions at St Clemens RC Church Cemetery McGregor, and Windsor Grove tombstone inscriptions (incomplete). The Heavenly Rest Cemetery Index is a separate file. Heavenly Rest Cemetery INDEX All sections This file contains all the sections transcribed as of 2018 including St Michael, St Joseph, St Jerome, St Theresa, St Patrick, St Peter, St Girard, St Ann, and Veterans. To search this file use CTRL F to locate the surname.